Violence and the threat of violence limit women's capacity to avoid HIV infection. Many women also experience violence because they are HIV-positive. The root cause of this violence is the imbalance of power in relationships between women and men, girls and boys. 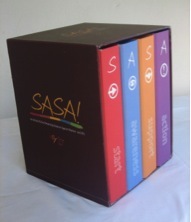 SASA! is a community mobilisation programme developed by Raising Voices in Kampala, Uganda. The Activist Kit is a comprehensive toolkit based on extensive field testing. It is designed for individuals and communities to start working toward a balance of power between women and men. The support phase guides communities in offering support to one another - joining their power with others to confront the dual pandemics of violence against women and HIV/AIDS. The action phase offers tools for communities to use their power to take action, with the aim to normalize shared power and non-violence. You can download a full introduction to the Activist Kit and other documents here.